Riff Raff Book Blog: The Goddess Girls! I love mythology! Love, love...LOVE mythology. I've been reading mythology since I was very young. My dad introduced me at a very early age to Roman mythology and the goddess of war strategy & wisdom Minerva (my middle name.) Since that time, my favorite goddess has been Minerva or Athena, her Greek counterpart. I've never been too far away from a mythology book. Currently, in my purse I'm carrying Parallel Myths a book on mythology from around the world. That said, it is no wonder I decided to push-start my own children's love of mythology. The Goddess Girls is a series based on the Greek Myths. The goddesses are in middle school with Zeus as their principal! Athena the Brain, the first book in the Series. 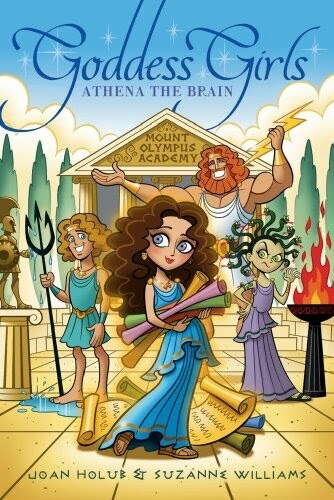 The first book is Athena the Brain and introduces the readers to Athena & mount Olympus Academy. Readers learn about how Athena became a goddess. Athena was "born" a full grown adult out of Zeus' head! (OUCH! She must've given him a terrible headache!) Having been born out of Zeus' head, Athena was indeed very wise & intelligent. Each book focuses on a different goddess. One by one, the series introduces young readers to the Greek myths. The next book is Persephone the Phony where the Grecian myth explains the reason for Winter. There are also Artemis the Brave and who could forget Aphrodite the Beauty. The next few books have been announced; they are Artemis the Loyal and Medusa the Mean. All of the books cover the basics of mythology, the Grecian Gods and Heroes. If you would like more information on when the books are coming out, or even better opportunities to win FREE COPIES, just click on Joan & Suzanne's links on the left hand side of the blog! There seems to be a renewed interest in mythology in general. With the Percy Jackson Series, the Kane Chronicles and the Heroes of Olympus out for mainstream consumption I really missed a book about the "Classic." This series is a new way to read those classic myths that to give the readers an understanding of basic Greek Gods, monsters, heroes and their deeds. I highly recommend it! As you get older and become avid readers, you'll find that many other books and stories refer back to the myths. Hopefully, one day, you'll decide to really take your study of mythology further and really get to know the gods! Other great books on mythology (Grecian in particular) are Heroes, Gods & Monsters of the Greek Myths by Bernard Evslin. A GREAT website to further your learning about the Greek Parthenon is Myth Web! It is a great source of information and even more stories! Who is your favorite goddess / god and why?